her 5min CD vocals ending: Don’t Tread My Turf! where lower nocturnal creatures crawl. may 15, 2000. Ain’t the library grand! Sometimes a walk through its marble passageways brings serendipitous enlightenment. A visit downtown, during the week before Mother’s Day, turns up an astonishing array of strange phenomena, crawling up toward the light like maggots and larvae long hidden under a rock. The tour begins as a trip down memory lane, a visit to the San Francisco of May 15, 1928, when the Bay Bridge was merely a gleam in a Congressman’s eye and the Divisidero district was described as "‘on the map’ as far as progressiveness is concerned." (Further reading reveals that "progressiveness" refers to new construction and new businesses.) The third-place Seals were playing the Hollywood Stars, who led the Pacific Coast League. At the St. Francis, Charlie Chaplin was starring in The Circus — "It’s a Hit… and How!" And coffee "roasted in San Francisco for Piggly Wiggly" was selling for 39 cents a pound. On the day before, the Chronicle, in conjunction with West Coast Theaters, had feted a group of welfare moms at the Warfield. Delivered from their "relief homes" to the theater by motor coach, 119 women were showered with candy and corsages. During the musical revue that followed, a member of the cast broke character and announced their presence to the rest of the audience, which responded with enthusiastic applause. An image forms — and quickly disappears — of a bus pulling up before Raphael House so that the Chronicle can take a group of resident mothers to a performance of Fosse. In a more easily pictured role, the Chron also sponsored its seventh annual trap-shooting tournament, an event that was overshadowed in later years by Brand Ex’s Bay to Breakers. Father’s Day shall come and go every year, and tens of millions of American Fathers and their sons will remain separated, angry, alienated and embittered, because American Fathers have failed to come together with their sons and ORGANIZE so that they can defend themselves against the radical FEMINIST MOVEMENT, whose satanic agenda is at the root of the disintegration of the American Family and male-female relationship, resulting in a society where the males are so confused, that the news of school shootings, church shootings, workplace killings, by alienated males, has become commonplace, along with prisons overflowing with young men, tens of thousands of homeless men, many of them Vietnam Veterans, criminal gangs, who sell addictive drugs and engage in violent crimes which keeps countless communities in chaos, and on and on goes the list of male woes. The tract ends with a solution: buy the author’s book on "patriarchy and numerology," which will explain all. There’s a bonus: purchasers are also invited to avail themselves of an "our international brothel-harem guidebook" and JOIN THE EXODUS FROM FEMINISTS!!! The presentation would be ludicrous if it were not so angry. And if it were not accompanied by other reminders of recent American scapegoating. Nearby, a bright orange flyer announces an exhibit at the library’s Hormel Center entitled Sheets in the Wind: A History of the Poster in the LGBT Community. 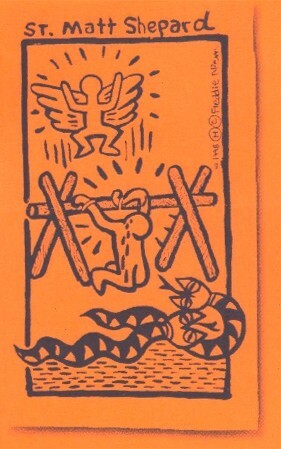 The illustrating artwork, by Freddie Niem, depicts the earthly torture and heavenward ascent of gay-bashed "St. Matt Shepard." It calls to mind the patriarchal numerologist’s insistence on lumping together "feminists" and "homosexuals" in his enumeration of America’s enemies. 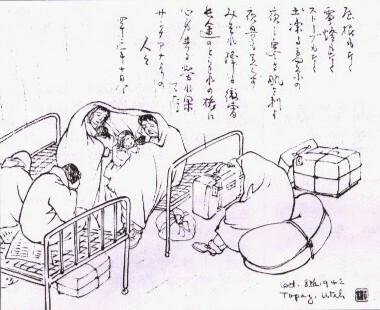 Nearby, the library’s newsletter announces a slide show of paintings and sketches made by Chiura Obata during his internment at Topaz. (The event coincides with an exhibit of Japanese-American concentration camp memorabilia at the California Historical Society.) Ancient history? Only the form has changed, as the pages of AsianWeek constantly point out. And a number of communications to the Call, prompted by the potential takeover of the Examiner by Ted Fang , suggest that some people still take the Yellow Peril seriously. There’s a move afoot in Washington to expand and clarify federal hate crimes legislation, and legal redress will surely provide some degree of comfort after the fact. But we’re looking at the wrong end of the horse. The only long-range method of combating attacks on gays or women or people of color — or any other group — is a deliberate program of education, beginning in preschools and extending all the way through the public school system. In a society where straight white males can no longer count on numerical superiority, it’s the least we can do — to alleviate frustration and prevent cruelty. Because the way things stand now, there’s a whole lotta hatin’ goin’ on.